This is a typical dish of Mexican taquerias and from northern Mexico . The best about this recipe is that it is very easy to make and the result is delicious – the perfect formula. With the combination of our main ingredients, the cheese and the chorizo, an interesting contrast is generated. On one side the soft and fresh flavor of the cheese is combined with the spicy and condimented flavor of the chorizo. Which turns out into an interesting dish that you have to taste. 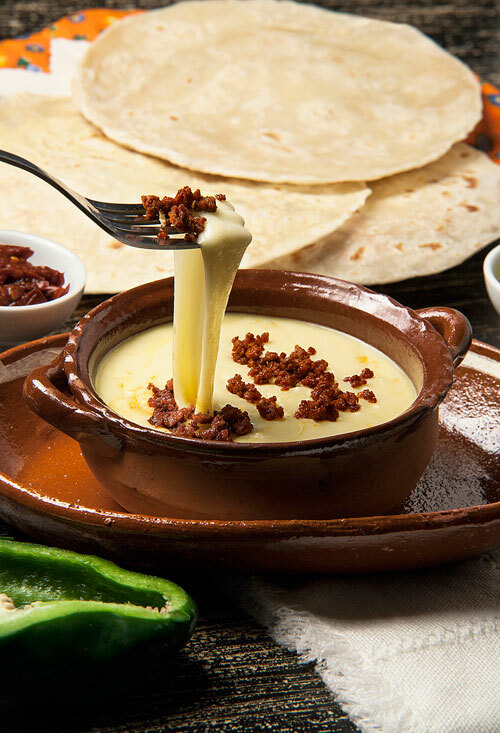 In Mexico the melted cheese is served as appetizer but it could also be a main course. This dish is always accompanied with flour tortillas to be eaten rolled like a taco or folded in half like a quesadilla. Although there’s also the option of eating this melted cheese as snack with some tortilla chips. In this recipe the chorizo is going to be fried and then the cheese will be melted; very easy steps to perform. One of the best cheeses to make the melted cheese is the Chihuahua cheese. If you don’t get it the Monterey Jack cheese or the Asadero cheese could also be used. If your preference are the corn tortillas they can also be used in this recipe. Prepare homemade chorizo and use it in this recipe, you will love its freshness. Recipe for 6 cheese and chorizo tacos. Dice 1/4 of an onion, then reserve. Finely chop 1.7 oz of chorizo, then reserve. Heat in a frying pan over medium-high heat 1/2 teaspoon of olive oil. Incorporate in the frying pan the chorizo that was minced and fry it for approximately 1 minute, until it releases some of its fat; stir regularly. Add in the frying pan the onion dices that were cut. Mix the frying pan ingredients and fry them for about 3 minutes, until the chorizo is lightly cooked; stir regularly. Then set aside. Transfer from the frying pan to the baking dish the chorizo that was cooked. Sometimes some fat accumulates on the melted cheese surface, if this happens to you remove it. Recommendation: Also put on the table some of the pico de gallo salsa – you will love the freshness and the combination of flavors . Variation: If you want to transform this dish into vegetarian use mushrooms. Did you like the Cheese with Chorizo? This is a device that everybody should have in their kitchen. You won’t lose more time cutting, grating or shredding ingredients. The “Presto Professional SaladShooter" will do all this for you and more in an instant. The “Chorizo Palacios" stands out from others for its quality and for its fresh and smoky flavor that everyone loves. You can bake the cheese with chorizo in the “CorningWare Dish". This dish is elegant, resistant and will make your food look good.